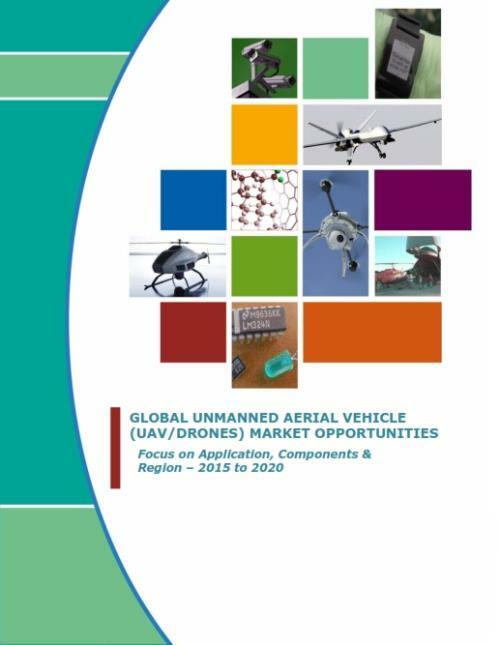 DUBLIN, IRELAND --(Marketwired - March 07, 2016) - Research and Markets has announced the addition of the "Global Unmanned Aerial Vehicle (UAV/Drones) Market Opportunities: Focus on Application, Components & Region - 2015 to 2020" report to their offering. The market growth of Unmanned Aerial Vehicle (UAV), commonly called drones, is propelled by an increasing demand in the commercial and military sectors. A reduction in the number of associated operational risks, along with innovative solutions, has created an increase in demand for UAVs in performing multifarious operations without extensive human involvement. Recently, in spite of the growth hindrance, to some extent, of UAVs due to a reduction in defense budgets of the US, France and Germany, the drone's combative role -- especially in the US, Middle-East and Asia-Pacific regions -- has significantly boosted its demand. This had also led to an ever-growing demand for UAVs across commercial applications. The report tries to answer various aspects of the UAV market; factors driving the UAV market, threats that can possibly slow down the market growth and the present growth opportunities that are going to shape the market expansion of UAVs. The research incorporates Porter's Five Force Model for in-depth analysis of the UAV market, along with an assessment of the factors governing it. The report is based on a comprehensive value chain, giving a clear understanding of the channels of market penetration and their involvement in the overall cycle of production and consumption of UAVs. What factors are currently challenging the UAV industry? Which compliances and certifications are necessary to make a product acceptable? Which country will lead the global UAV market by the end of the forecast period? Who are the key players in the UAV market? What is the trend of different end-use verticals? What is the regional acceptance trend of the UAV devices and services?